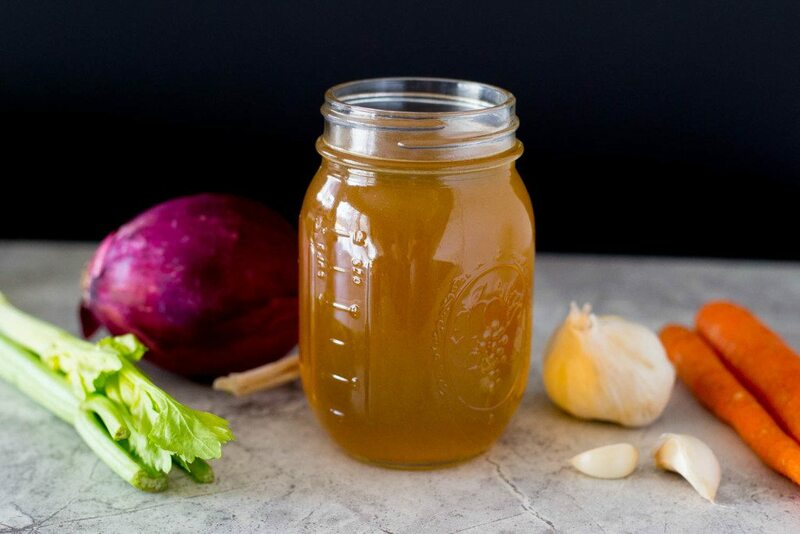 This super easy, homemade vegetable stock will save you so much time and money! Made with a little bit of love and full of taste, this veggie stock will ramp up the flavor of any dish you make. 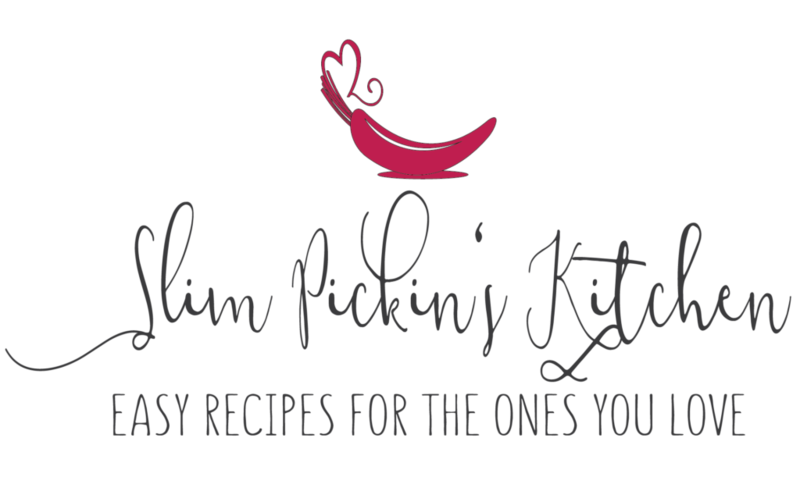 Store bought stocks can be a super expensive ingredient to have on hand, but it seems like so many recipes are calling for it these days! Not only that, but most recipes also only require one or two cups, leaving you with half a carton that can easily go to waste. 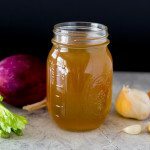 Making your own vegetable stock at home will save you time and money because it’s made from leftover vegetable scraps that you would otherwise throw away as well as every day ingredients that I guarantee you already have in your pantry at this very moment. Way back in the day when I was in culinary school (I never completed it, I only went for a year) one of the first things we learned was that nothing went to waste. We were taught to collect vegetable scraps i.e. 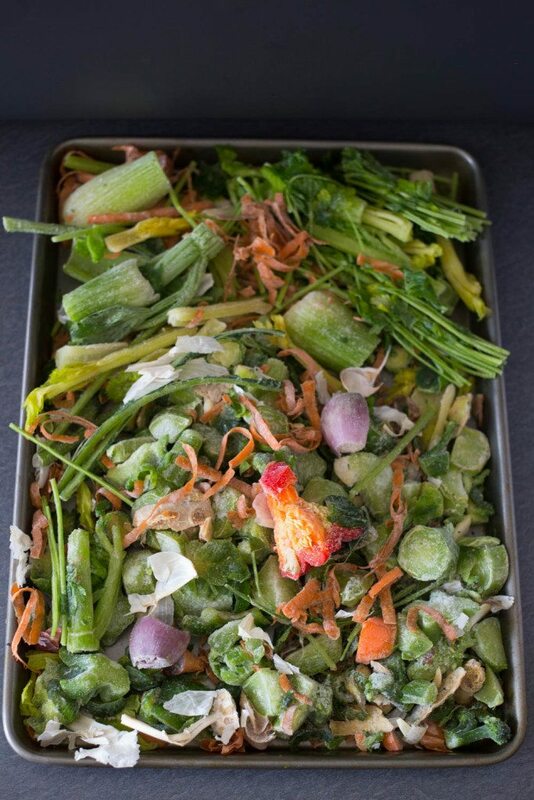 carrot peels, garlic & onion skins, celery leaves, bell pepper hearts, and the stems from fresh herbs in order to reuse them in either the compost pile or for making homemade vegetable stock. 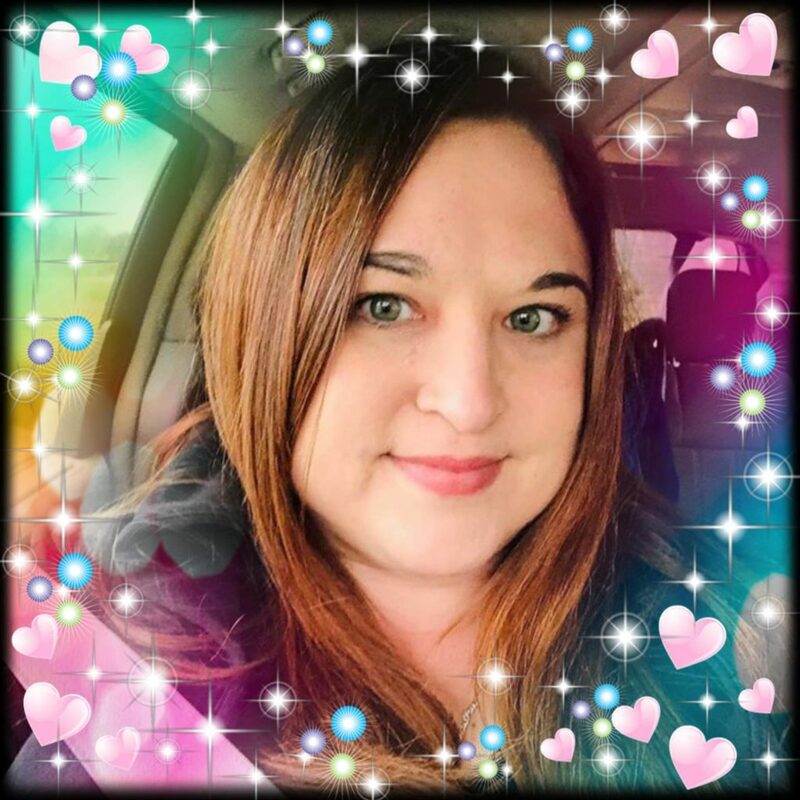 Making your own stock truly couldn’t be simpler, will only take up about an hour and a half of your time, and you’ll end up with so much more product than you ever would have gotten from the store. Essentially all you have to do is take a gallon sized freezer bag, write the date on it, and start collecting vegetable trimmings throughout the week/month as you’re preparing your family’s meals. Peel an onion? Throw the skins into the bag. Remove the outer leaves of some Brussels sprouts? Throw them in the bag. Chop some garlic? Throw the skins in the bag. Grate some ginger? You guessed it, throw the leftovers in the bag! Keep the bag of scraps in your freezer then, once the bag is full, throw everything into a pot, cover the veggies with water, add some salt & pepper and a few bay leaves then simmer for an hour and strain. Now, you’ll obviously want to be a little careful and make sure to remove any loose dirt or stickers from your vegetables. Nobody wants dirty vegetable stock, and I also highly suggest you at least have carrots, onions, and celery a.k.a. mirepoix a.k.a. the flavor makers, for the stock, but those are the only thingsyou have to worry about here. A lot of other recipes I’ve seen claim you can’t use certain vegetables or you need to add fancy schmancy ingredients that nobody has ever heard of (what in the crap is umami?!?) or you need to roast the vegetables first, but, for the love of all things, ain’t nobody got time for that. Leftover vegetable & herb trimmings simmered with bay leaves, olive oil, and salt and pepper is all you need to make a quick and easy homemade vegetable stock that will add a dash of goodness to any dish you make. 1 gallon sized bag full of leftover vegetable trimmings carrots, onion, celery, mushrooms, leeks, garlic, bell peppers, etc. Collect vegetable trimmings and freeze until the gallon bag is full. 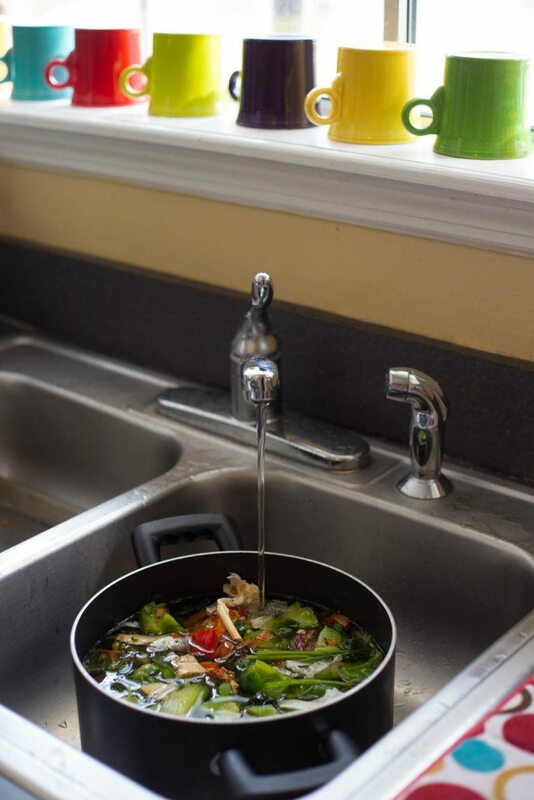 Add the scraps and bay leaves to a large stock pot, top with enough water to fully submerge the veggies, drizzle with olive oil and salt & pepper. Bring to a simmer and cook for as little as 45 minutes and up to 1.5hrs. NOTE: There is no need to cook for longer, but you can if you want! Using a fine mesh sieve or cheesecloth, strain the juices from the veggie scraps. Discard all leftover veggies. Allow mixture to cool to room temp, then divide evenly between 24 muffin tins or plastic freezer containers and freeze until ready to use. I never realised it was this easy to make veggie stock! I’m going to be making it from home from now on! Yes, yes, yes! It is so easy to make your own stock and, once you do, you’ll never buy store bought again. 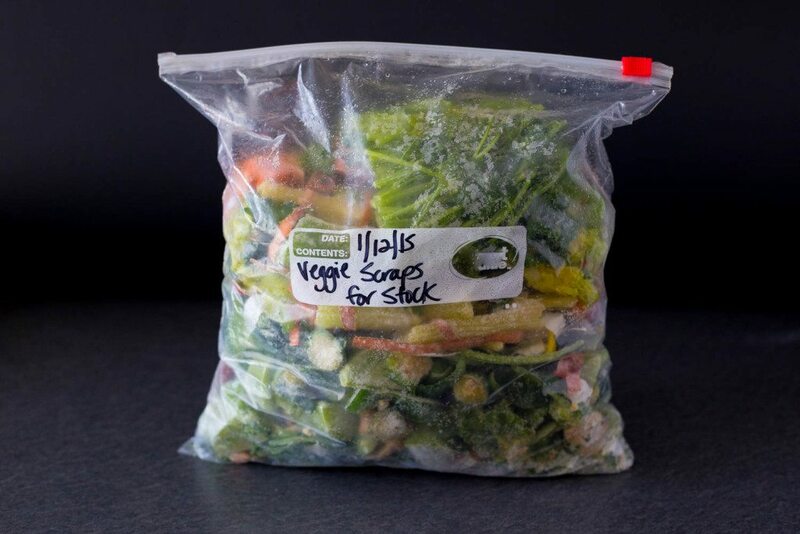 LOVE LOVE LOVE the idea of the veggies in a freezer bag like that. I compost so much but this is another great idea! Love it!